Normally when video game companies go into Internet name court to take over domains using their trademarks, they walk out a winner. So you'd think that Nintendo would be easily successful in the effort to get control of WiiU.com from a cybersquatter. You'd be wrong. Astonishingly, Nintendo's complaint before the World Intellectual Property Organization has been denied. The company was trying to get control of WiiU.com, which was registered back before even the Wii existed: Jan 13, 2004. No reason was given for the denial in the WIPO's decision, reached on June 19 but posted yesterday and reported by Fusible. WiiU.com right now is a placeholder page redirecting visitors to various links, some related to the Wii U, others not. This would seem to be an ominous sign for Microsoft, which also does not control XboxOne.com and has filed a complaint to take control of it—though that matter is before a different body, the National Arbitration Forum. Fusible noted that WiiU.com was up for auction before Nintendo filed its complaint in February. The company may now have to pay quite a hefty price if it wants the domain. I've reached out to a Nintendo representative. Any comment the company makes will be updated here. 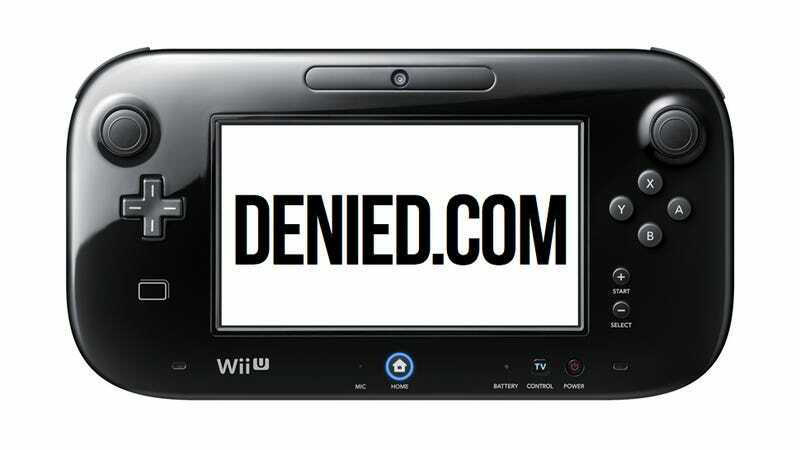 Nintendo’s efforts to recover the domain name wiiu.com through a Uniform Dispute Resolution Policy administrative proceeding were unsuccessful. Nintendo has a strong history of protecting against infringement of our intellectual property rights and we are continuing to review our legal options. This decision does not impact Nintendo’s ability to enforce against violations concerning intellectual property.